Round 3 produced several upsets and rating points were exchanged in all nine games with 16 rises and falls in the rankings. A very dynamic round could best describe it. There were even rises and falls amongst the provisional nations. Read on for WFN World Rankings 16th August 2014 after Round 3 IC14. 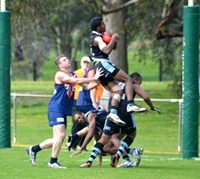 The inaugural Dosti Cup was contested on Saturday at Highgate Reserve in Cragieburn, an outer northern suburb of Melbourne. Dosti is the Hindi and Urdu word for Friendship, the spirit in which India and Pakistan would play this game of football. The home of the Manningham (formerly Bulleen) Cobras at Koonung Reserve in Bulleen was the scene for a Pool of Death (Pool A) match between the Great Britain Bulldogs and the ever improving Fiji Tribe. With the local team in the VAFA, their reserves kicked off the early morning dew and by the time the IC match was ready to go the ground was bathed in weak morning sun glowing through the low clearing cloud and in fine firm condition to allow the players to showcase their wares to the local crowd. Great Britain sitting 1 and 1 after a first up win against the French followed by a tough and bruising loss against an impressive Nauru. Fiji first up showed a bit going down to the Irish and then had a percentage booster against the hapless Garudas. In the battle to sneak into the Division one 4th place this would be a tough ask – as neither side would give an inch. With cool and calm conditions prevailing and an overcast sky – the USA Liberty (the ‘B’ team) had a tough task in taking on the inaugural IC women’s champions in Ireland (the Banshees). Perhaps to the chagrin of the ‘A’ team (the Freedom) who would love to take on the Irish – the goal for the Liberty would be more about limiting the damage and seeing if with an ounce of luck and a ton of pluck that they might just sneak a goal. They had the first round bye and on Wednesday had been given a trouncing by the Northern Lights. The Banshees on the other hand undefeated thus far with a tough opener against the debutant Fiji Vonu and a round 2 victory over the other debutant nation Tonga. Aimee Legault has proudly led her team, the Canada Northern Lights, onto the fields of battle in this year’s International Cup. Aimee has taken the time to share her footy journey with us. The Canadian Northern Lights defeated a much improved Fiji Vonu on a foggy morning at Mulgrave Reserve, hosted by the Eastern Devils for Community Round. Fiji were winning the early knockouts, with #14 Cathy Bale dominating in the centre, but the Canadians still read the play and took to early lead with #10 Aimee Legault opening up the scoring. The Lights kicked the only three goals of the quarter and kept the Vonu scoreless. To make matters worse #14 Bale received a concussion and had to sit out the rest of the match. Canada led Fiji 3.2.20 to 0.0.0.